I'm such an impulse buyer, it's something I really have to stop doing. Shopping is fun though, a little too much fun. I love everything you picked out, the color of the dress is great, as is the color of the pink bag! That's a lovely dress and I'm sure it'll be really versatile. Recently I do think how many times will I wear it and can I wear it for day & night etc before buying something, trying to watch the pennies! I impluse buy and then feel guilty! Idon't take it back though as I can't bare for anyone else to have it haha!It terrible! The dress is gorgeous Gem! Love this, and I think the shade of blue would look so pretty on you! I'm definitely one for weighing up purchases, so much that I uuhm and aah loads and by the time I've decided to buy it the item has sold out! Gah. The purple bag (and dress!) is gorgeous! I agree, all about quality. I'm looking for plain items and buying less things like midi skirts. Classic all the way! 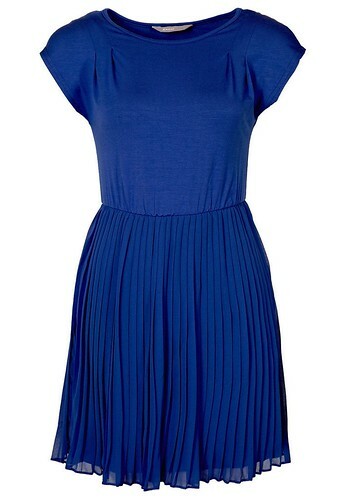 That dress is gorgeous, I love the pleated skirt and it's such a pretty colour. It definitely looks like it would be really versatile! I'm much more of an impulse buyer, I buy things because I like them but when I get home I realise I've got nothing to wear them with! I really need to try and plan some outfits before I go shopping!